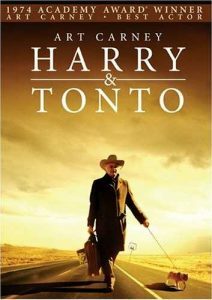 Movie review of Harry and Tonto, starring Art Carney, in his Academy Award (best actor) winning role as Harry, a retired teacher in his seventies living in an area of New York City where he and his deceased wife raised his children – where he’s lived all his life. The building he lives in is torn down to make way for a parking garage. So Harry and his cat Tonto begin a journey across America. He visits his children, sees the world he never seemed to have the time to see before. Along the way, he makes new friends and says goodbye to old ones. Art Carney shines in this poignant drama about an aging widower’s determined search for a better life. Harry (Carney), who lives in New York with his pet cat, Tonto, is having a rough time of it. Not only does he keep getting mugged, but the huge wrecking ball outside his window is about to demolish his apartment. So Harry bids farewell to the city and sets out for life in the suburbs with his son’s family. But son Burt is too stuffy and his wife is too bossy. When a stay with Harry’s single daughter doesn’t work out either, man and cat head West in a second-hand car, meeting bizarre characters along the way. Finally, they reach L.A., where Harry moves in with his other son Eddie (Larry Hagman). But by now Harry’s realized he likes being on the road and hasn’t yet had his fill of adventure. Highlighted by Carney’s outstanding performance. This moving story lights up the screen with a wit and wisdom that is rare and beautiful.